According to several recent studies, how a caller perceives their first interaction with your business is the basis for which they will forever think of your company. And, due to the lack of non-verbal communication which we rely heavily upon in person, it is dually important to watch your p’s while conducting business over the phone. Yes, you read that correctly—watch your p’s. 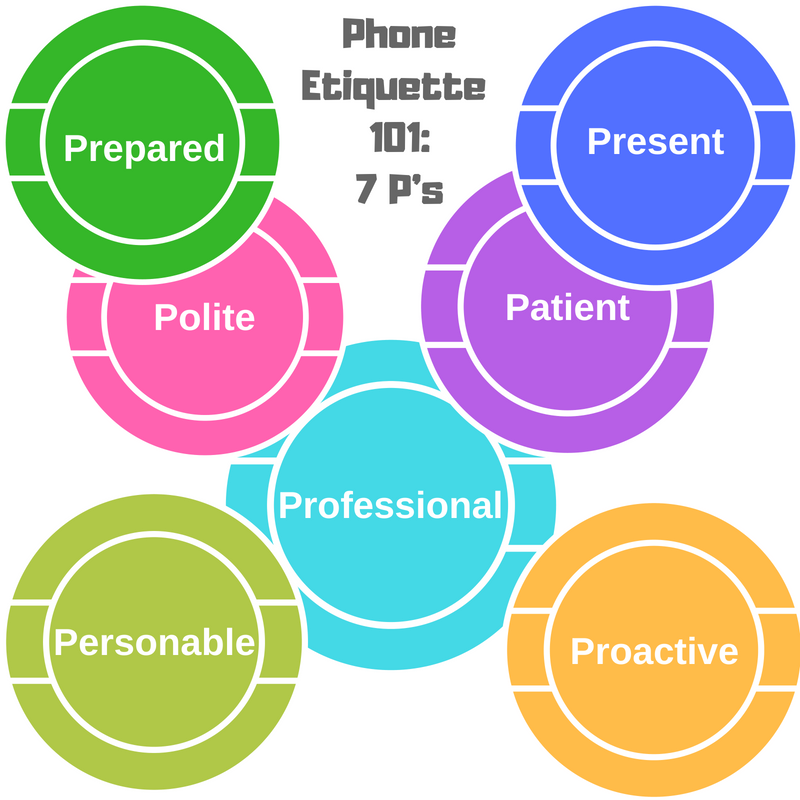 If we were teaching a business phone etiquette 101 course, it would consist of the 7 p’s of call handling excellence; be prepared, be present, be patient, be polite, be personable, be professional, and be proactive. 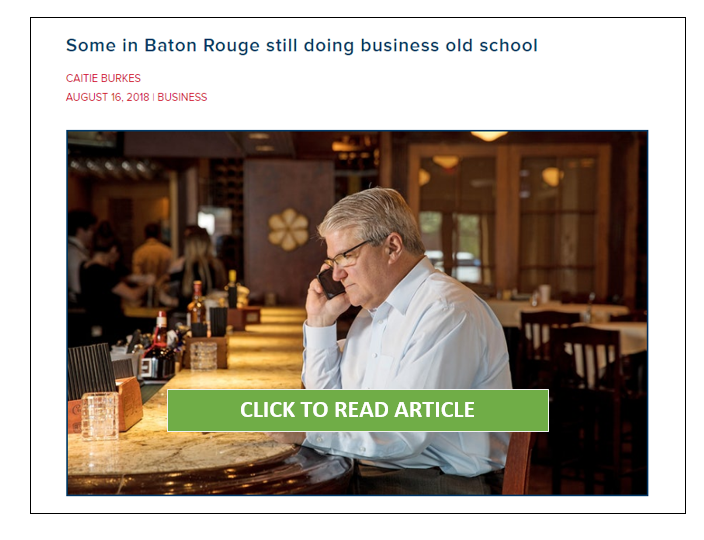 After 60+ years in business, answering phones for our clients, we have come to understand that these are the essential components to successfully represent any business when answering the phone. With all other communication alternatives provided to consumers now—email, chat, online forms—when a person makes the decision to pick up the phone and call your company, they are looking for an immediate response. If customer experience is at the top of your agenda, then you need to be prepared to answer your calls by having an educated staff and making sure that they are giving your callers a consistent call experience by being conscientious of the number of rings on average it takes for someone to speak with a person in your establishment. If you are going to have a business phone line, then you need to be prepared to answer it when it rings. 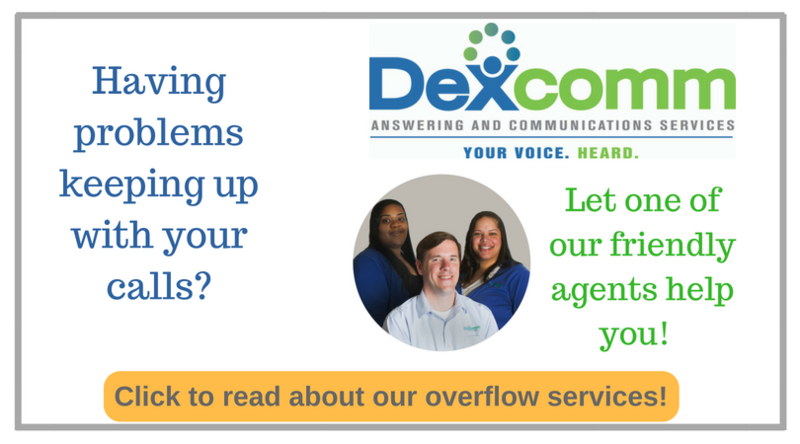 The industry standard for us is 80 percent of calls answered in three rings or less. Other industries, say four rings or less, and there are even arguments for six rings or less. To put this discussion into perspective for you, depending on your phone system, generally 15 seconds will elapse within a 4- to 5 ring time-frame. For any caller, this can seem like a very long time. There is nothing like speaking with someone on the phone that you perceive is not present during your call. We don’t care for it during personal calls—ever had to ask someone if they were talking to you or their dog? And, we certainly don’t like it on business calls. What are the tell-tale signs that someone is not present during a call? They ask why you are calling when you already stated why at the beginning of the call. They ask you for your name multiple times during the conversation. In general, they appear to be disengaged from the conversation. Lost in space, if you will. A study conducted by the American Psychological Association reports that the mind and brain were not designed for heavy-duty multitasking. What this means for you is that if you are going to be truly present during a call, you need to disengage from all other activities and focus on your caller. As we tell our agents—treat every call as your most important call, because in business, they are. Being polite isn’t just about saying “please, excuse me, and thank you.” It is about giving your caller the same respect and consideration that you would expect someone to give you when you are trying to conduct business over the phone. Many people think that answering phones is something that anyone can do. 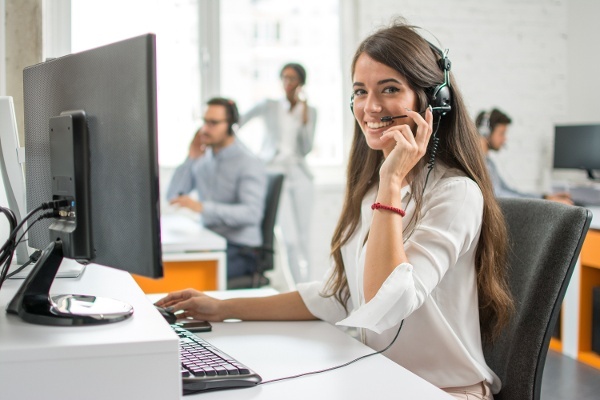 Sure, anyone can pick up a phone and answer it, but not everyone has the personality or customer service skills to properly navigate through tough calls and remain polite to each and every caller. When we hire phone agents, we look for those individuals who know how tough it can be to serve the public, but still love to do it anyway. Why? Because these individuals have an innate knack for giving customers a consistent experience no matter the context of the call. We highly recommend that you look for the same type of staff to monitor your phones too. Patience requires you to be steady, even-tempered, and avoid provocation. Impatience is said to occur when we perceive that something is blocking us from attaining a goal. One way to combat impatience when answering your phone lines is to disconnect mentally from all other projects. When you hear the phone ring, train your brain to switch priorities to pleasing the caller on the line. This can help you remain focused on the task at hand. There is no doubt that a disconnect exists while conducting business over the phone. Because of this, being personable on a call requires you to utilize your communication skills to their fullest. It is important to remember that every voice that you hear belongs to an actual person. And, that each person can have a very significant impact on your business, should you fail to make a connection with them at some level during your conversation. Simple things like using the caller’s name, carefully watching the inflections in your voice, and verbally checking back with an “mm hmm, ok,” or immediate responses to questions, are a few ways that you can make a stronger, more personable connection with your caller. Your communication skills play a massive role in the conveyance of your professionalism over the phone. Your tone of voice, your pitch, the rate at which you speak, your articulation, your pronunciation, and your diction all matter. 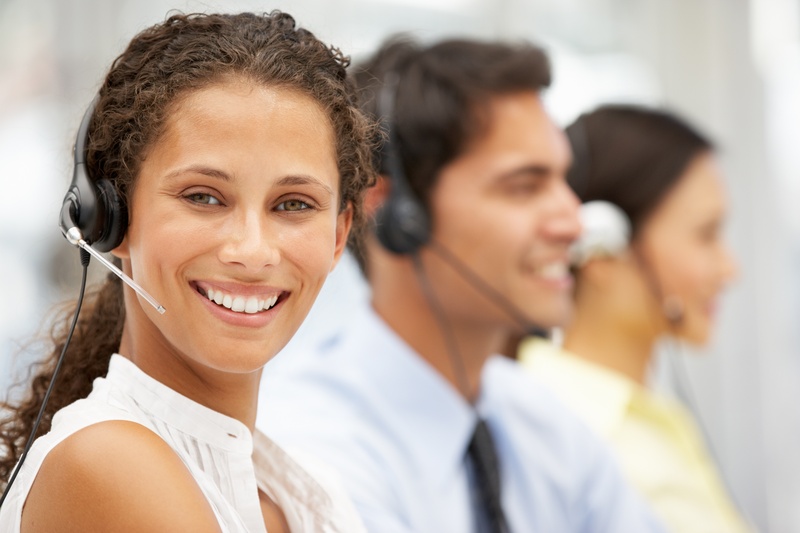 We tell our phone agents to smile before answering and when speaking to callers. This may sound silly, but it actually improves the perception of your clarity to the callers due to physiological reasons—which is why we will recommend this to you, too. In addition, if you imagine that a person just stepped in front of you when your phone begins to ring, this can be a game changer for your interactions with your callers. Would you flail your arms in frustration or make faces in front of a client? 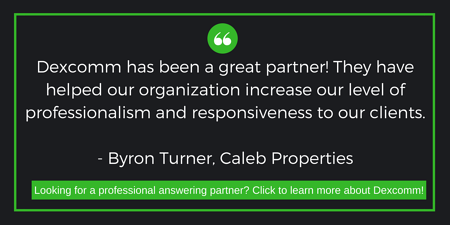 If you want to keep your customers happy, or your business alive—which we hope that you do—you most certainly would not! You should conduct your calls with the same body language and actions that you would with a live person. Every person that reaches your business should be treated professionally, even if you can’t see them. On top of lowering your professionalism when you act out with poor body language during a call, it can affect the way that you project your voice. And, as it turns out, most people are pretty perceptive at reading your emotions, even when they can’t see you. One thing that is universal among all callers is their dislike for feelings of uncertainty after a business call has ended. For example, while we make it a point to get to know as much as we can about our customers’ businesses—it is impossible for us to know everything about all of them. Because of this, we understand that we will not be able to resolve every call, and we have established protocols for taking excellent messages with pertinent information, in addition to taking added steps to proactively assure the caller that we will be moving their call down the pipeline. While taking an excellent message is a vital component of call handling, a message is meant to assist internal operations. It will do nothing for your caller’s peace of mind. This is why at the end of each call, our callers are armed with two things; the agent's name who handled their call, and where their message is going to go once it leaves our hands. You should never let a call end without assuring your caller that you are proactively taking steps to help them resolve their issue. When trying to attain call handling excellence, it is important that you do everything in your power to avoid impeding the flow of communication. Effective phone etiquette requires you to be: prepared, present, polite, patient, personable, professional, proactive. Lapsing on any of the 7 p’s can have a negative impact on your caller experience, which can lead to a negative impact on your company image, and ultimately negatively affect your bottom line.